We love the energy of small towns and Peninsula offers abundant enthusiasm to welcome visitors with fun, food and activity. Tomorrow is Peddler’s Day in Peninsula… sidewalk sales, garage sales, special offerings by all of the merchants in town. 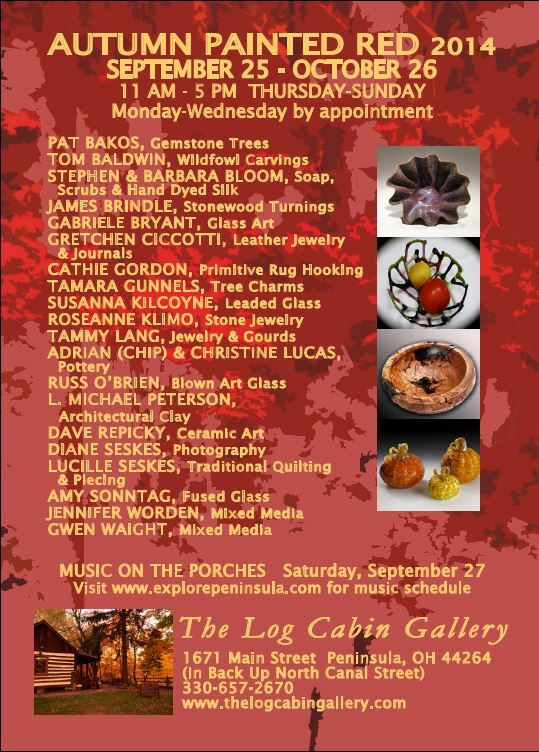 And in conjunction with Peddler’s day the Log Cabin Gallery will be open and featuring amazing things that focus our thoughts to the fall, the colors of autumn, the sights and scents of this season. And we will be there for part of the day…. helping out. We look forward to seeing you. Stop out just to see the log cabin, or stroll the streets of Peninsula and soak up the spirit and enthusiasm. And the fall color is coming, slowly.